Today’s consumers are health conscious, technology savvy, and want the freedom to choose, but the insurance industry often struggles to keep up. At SCOR, we are passionate about developing solutions that meet the needs of the next generation of consumers. And that’s why we’ve partnered with key players in the wearable technology industry to develop the Biological Age Model (BAM). 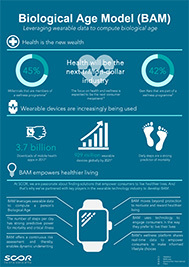 Making the most of wearable data, BAM not only continuously assesses how we are living, but empowers and coaches us to make the right choices to live healthier lives. Customers today are more digitally-enabled, more health conscious and more demanding of customized products and services that offer greater freedom and flexibility. Despite the global trend towards health, consumers are rarely incentivized to improve their lifestyle and they are provided only limited advice on how to do so. Devices that are already a part of our day to day lives (such as wearables) are underutilized and not achieving their full potential to engage. Single point underwriting pays little attention to consumers’ lifestyle and wellbeing after the underwriting is complete. Underwriting processes can be tedious and overwhelming, giving little consideration to the customer experience. At SCOR Global Life, we are passionate about finding solutions that empower consumers to live healthier lives. With the growing adoption of wearable devices and technology, SCOR and Vivametrica uncovered the ability to use real‐time data to underwrite and to empower consumers to make informed lifestyle choices. 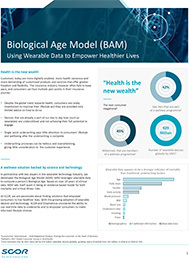 BAM leverages wearable data to compute a person’s Biological Age. Based on over 20 years of clinical data, BAM sets itself apart in being an evidence‐based model for both mortality and critical illness risks. We have also published a white paper detailing our study with Vivametrica – kindly reach out to your market’s SCOR representative for additional information.